Islamist rebels including Nusra Front launch attack on Mastuma base in Idlib one week after capturing provincial capital. 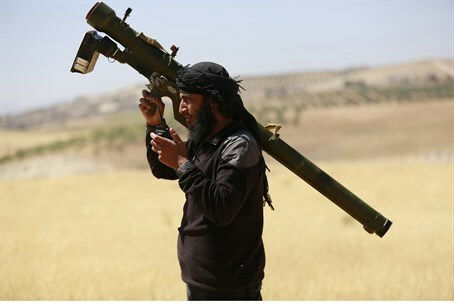 Fighters from Al-Qaeda's Syrian affiliate and allied groups advanced Friday on a key government-held military base in northwestern Idlib province, a monitor said. The base, seven kilometers (four miles) south of Idlib city, is the biggest regime base in the province, according to Observatory director Rami Abdul Rahman. With the fall of the city, regime forces in the province control only two towns and a handful of districts, along with the Abu Duhur military airport and five military bases. Elsewhere, the Observatory said jihadists from the Islamic State group (ISIS) had seized more territory inside the Palestinian Yarmouk camp in Damascus. The group, which has never been so close to the heart of Syria's capital, launched an assault on the camp Wednesday, after Palestinian groups inside arrested several ISIS members. The jihadists were pushed back, but Thursday encroached again inside the camp, which has been under regime siege for more than a year.